An MP from Cornwall is calling on the government to allow the county to be given more say over the day-to-day running of its affairs. North Cornwall MP Dan Rogerson is presenting a parliamentary bill calling for the county to be treated like Scotland and Wales. Mr Rogerson said the bill aimed to take away power from Whitehall and quangos. 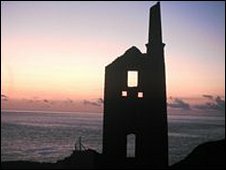 He added he hoped the bill would show there was a political will for Cornwall to be recognised as its own nation. Mr Rogerson said his Government of Cornwall Bill identified a range of topics on which he thought the county should have more say, including education, housing, agriculture, heritage and economic sustainability. He said many of his constituents were hugely frustrated about national decisions that "do not make sense in the county". He said: "I believe strongly that Cornwall should re-assert its rightful place within the United Kingdom. "Cornwall is a unique part of the country and this should be reflected in the way that it is governed." He added: "If the government is going to recognise the right of Scotland and Wales to greater self-determination because of their unique cultural and political positions, then they should recognise ours."